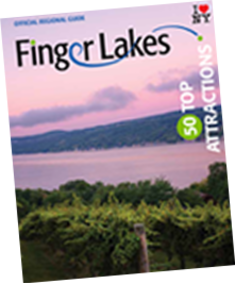 Over 75 trails meant for hiking and biking cover every crevice of the Finger Lakes Region. From the Six Mile Creek Gorge Trail (#20) in Ithaca, NY to the Mural Trail Tour (#66) in Lyons, NY to the Parks to Golf to Ice Cream Bike Trail (#54) in Bloomfield and Victor – it’s time to follow the beaten path to some of the region’s best sites, scenes, and experiences. Choose from one of our “Let’s Go Hike & Bike” PDFs below and follow the dotted line to new adventures. Just don’t forget your helmet or hiking shoes!